Here is something quite exciting if you are an old motorcycle drag racer, or even if you are just a fan. Granddaddy Joe Smith's All Harley Drag Racing Forum is a great new bulletin board started by none other than world famous drag racer Joe Smith. On it you will find discussions on Harley drag racing from all the way back to its beginnings in the '50s up to present day, along with great vintage as well as contemporary photos. Best of all, many of the comments are by those who were there and created those memories. The forum is only a couple months old, and already has a lot of pictures and info on it, so I am looking for great things from it in the future. 1 Corinthians 2:1-5: And I, brethren, when I came to you, came not with excellency of speech or of wisdom, declaring unto you the testimony of God. For I determined not to know any thing among you, save Jesus Christ, and him crucified. And I was with you in weakness, and in fear, and in much trembling. And my speech and my preaching was not with enticing words of man's wisdom, but in demonstration of the Spirit and of power: That your faith should not stand in the wisdom of men, but in the power of God. I can relate to verse one of this passage. I don't have a good speaking voice. When I preach, the passion I have for the subject does not really come though very well. I certainly don't have any great wisdom of my own to give. But just as verse one says, I do seek to declare the testimony of God. And I feel that like Paul, I need to concentrate on what he says in verse two; "For I determined not to know any thing among you, save Jesus Christ, and him crucified." Many religions claim to know about Jesus. Some call him a great teacher. Some even call him a prophet. Most of them draw up short of what was so important to Paul: "Jesus Christ, and him crucified." There is much else to be said about Jesus, his life and his teachings, all of which Paul knew, but he gives us the impression that the most important part is "him crucified." What is it about this aspect of Jesus ministry that was so important that Paul declared that he was bound and determined not to preach anything to the Corinthians except "Jesus Christ and him crucified? Most false religions admit to the sinfulness of man, though there are exceptions. Most of those religions would admit that sin has separated man from God. In that they are correct. Their method of dealing with that sin, is where they leave the Bible. Most offer some form of a set of scales which weigh man's sin on one side and a his good works on the other. If the good works outweigh the sin, they believe that they will go to heaven. Some false religions come closer to the truth. They teach that you need to use those same scales to weigh a man's sin against his good works, but they seek to throw in Jesus death on the cross to tip the balance in their favor. But the Bible says that all of our righteousnesses are as filthy rags. That's right, all of our righteousness, all our right acts, all our good works are no better than filthy rags in the sight of a holy God. That is why Jesus Christ, and him crucified, is so terribly important. The Bible says that if righteousness could come by keeping the law, then Christ died in vain. In other words, if righteousness could come from a man's goods works, then there was no reason for Christ to die on the cross. Righteousness does not come from keeping the law. None of us has even come close to keeping the law of God, and no one ever has, except for Jesus Christ. That is why Paul made it a point to make so much of Jesus Christ, and him crucified. Christ's death on the cross in payment of our sins is the only path to reconciliation with God. If we go back to that set of scales that all of those religions like so much, here is the situation in light of what the Bible teaches. A man's good works on one side of the scale and his sin on the other is a lose / lose situation. His sin will earn him hell, and his works cannot earn him heaven. Likewise the one who tries to balance his sin on one side of the scale against his good works plus Christ's righteousness on the other has also lost his soul, for Galatians 5:4 says "Christ is become of no effect unto you, whosoever of you are justified by the law; ye are fallen from grace." Do you see what this verse is saying? If you seek to be justified by the law, then it negates grace. You can either be justified by the keeping of the law or justified by grace, but not a combination of the two. And since no man will ever be justified by keeping the law, there only leaves one avenue. Galatians 2:16 "Knowing that a man is not justified by the works of the law, but by the faith of Jesus Christ, even we have believed in Jesus Christ, that we might be justified by the faith of Christ, and not by the works of the law: for by the works of the law shall no flesh be justified." Back to that set of scales one last time. There really are a set of scales, at least figuratively speaking. But they are God's scales and they operate by his divine rules. Each person's sin will be weighed on one side of that scale, but there is only one thing that can go on the other side to tip the balance in your favor, and that is the righteousness of Christ. It is Jesus death as a payment for our sins, and his death alone. The only one that can tip the balance in your favor is Jesus Christ, and him crucified. Here is a quick and easy little tech tip for those of you who have early bikes that use a lot of Parkerized parts. As you probably know, Parkerizing is a process that protects metal parts from corrosion, leaving them with a dark gray appearance. It was widely used through the 1940's on Harleys, especially on hardware. 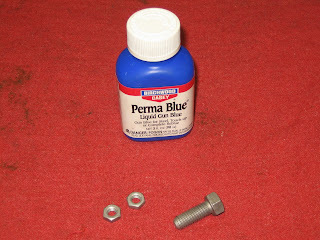 While it is not a complicated process to perform, and there are kits available for the do-it-yourself-er, there comes a time in every restoration when you realize that you forgot to get that one bolt Parkerized. Rather than getting the Parkerizing solution out and tricking the wife into leaving the house for an hour so that you can use her kitchen stove to bring it up to temperature, you can always use the handyman's secret weapon. No, wait ....that's duct tape. OK - the restorer's secret weapon; instant gun blue. 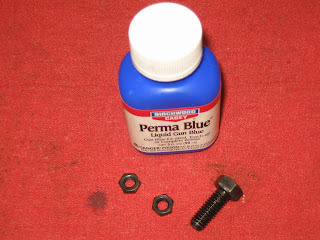 All you need is a bottle of instant gun blue, and your part. For best results the part will have been cleaned by glass beading (just as if it was to be Parkerized). Dip the part in the bottle for a few seconds, rinse, oil the part and you are done. Turns a half hour project for one bolt into a minute or less. I like to use a mechanic's magnet to hold the bolt, though a wire would work fine. Automatic Transmission Fluid is a great deacidifying oil to finish the bolt with. The finished product is virtually indistinguishable from Parkerizing. The bottle of instant blue in the before and after pictures is one I picked up at Fleet Farm for under $10 this spring. I doubt that the brand matters. The last bottle I had lasted about 10 years. This post is directly prompted by what my friend Joe over at Hear God Speak posted today. Titled "A Thought for 9/11/09" the post is simply a quotation of Luke 13:1-5. To paraphrase the Bible, some people came to Jesus with news of a tragedy in which others were killed. Far from comforting the people by telling them that it was not a judgment of God on those killed, Jesus told them that those who had died were no worse sinners than they themselves. He went on to say, that unless they repented, they would all likewise perish! A very appropriate topic for this day. I recall the days following 9/11/01. At the time I was a member of a small Baptist Church that went door to door on Thursday evenings. That first Thursday I was met with more openness to hear the gospel and more appreciation than at any time before or since. In that next week, our Church had far more visitors than normal; even some for the Wednesday night service. I remember thinking "is this what it takes to get people's attention?" But, of course, by the time another week had passed, all had returned to normal. Friend, if it only lasts a week, it can't be called repentance. Please pray for our nation. Is it possible that the decline in our nation’s healthcare could be the amount of prescription medications the American people are now taking? It seems that every ailment, mental or physical, now has a drug available to “fix” it. I once sat at a table of seven grown women, doing crafts of all things and within an hour came to find I was the only one not on something. They suffered from OCD, depression, and anxiety. My husband and I often crack jokes about this topic, “I’m tired” there’s a pill for that, “I’m angry and out of patience” there’s a pill for that, “I’m constipated” there’s a pill for that. The crazy thing is there really is a pill for just about everything. Whatever happened to the good old-fashioned attitude of our forefathers. You’re depressed? Put on a happy face or grin and bear it. Your child has too much energy and can’t sit still? Send them outside to play! Our society has become too quick to label everything and I believe the second you give the problem a clinical diagnosis you no longer think you have the power to change it! I’ve recently watched first hand someone “battling” depression. Medicated and seeking counseling, her attitude was appalling. She truly believed and said “ I can’t find joy in anything because of my illness”. I instantly flashed to the scene from the movie “Airplane”. I wanted to grab her by the shoulders, shake her, and yell “snap out of it” with a good slap across the face. And why in the world would the side effect of an anti-depressant be thoughts of suicide? Does anyone else find that alarming? And when you seek counseling for depression they have you dig deep into your past because of course you know any problem you have as an adult can be traced back to something that must have happened to you as a kid. Give me a break! If that were true and certain events of our childhood determined us as adults, this society would be more screwed up than it already is. Maybe if the drug and insurance companies would stop over-prescribing for everything imaginable, the healthcare system wouldn’t be where it is today. And if you can’t quite stomach this article or agree with me, I’m sure there’s a pill for that too.